Many people, the human resources of the country, are being lynched with a trigger of violence by the Mob led by simple spread of fake news on social media, WhatsApp group. Despite all the laws in place, the intolerance is growing and the Mob without getting to the truth, jump to the conclusion that leads to the lynching. In American English a “Mob” is a gang of criminals and gangsters are also called the mobsters. 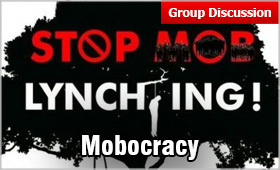 Indian democracy judged by recent happenings of lynching led by fake news is turning into a mob rule or what may be called a “Mobocracy”! A mob has just to follow mentality and does not think about right and wrong. This is what is happening for quite some time in the country despite the stern warnings issued by no other than the Prime Minister of India. India has been a heaven for Mobocracy in the past also. However, there has been a sharp rise in lynch-mob incidents since 2015. Sometimes it is the misconceived notion of cow slaughter, organ selling, child kidnapping the rumours, fake news of which are spread by the miscreants leading to violent lynching by the mob. It is happening in every part of the country. Kashmir is another example where the mob has been resorting to stone pelting to protect the terrorists and incidents of killing the police personnel on duty reflect the mob intolerance. Politicians from all the communities are more concerned about their vote banks and continue instigating the Mob to resort to uncivilized acts. Despite repeated warnings by the Prime Minister of India, Shri Narendra Modi, the mobocracy has not subsided. A man in neighbor hood was killed in a village outside New Delhi because his neighbors got convinced that he was in possession of beef. The thieves and criminals found a new way committing the crime in the name of Cow Protection and killed many people, ran away with the booty while the onlookers were booked in road incidents. In the latest lynching incident, a mob killed five people after rumors spread on social media that they were trafficking children. The perpetrators in the Mob resorting to lynching are largely villagers. May of them are using their smart phones for the first time. Inflamed by fake news of child-trafficking, Cow slaughter, inter religion marriages sent as the WhatsApp messages, they resort to their own criteria of justice which is attacking and beating to death people who often are innocent. Honourable Supreme Court of India has urged the government to pass a new anti-lynching law and to stop the spread of Internet rumors after dozens of people were killed in a string of mob attacks fueled largely by the fake news on social media. The roots of democracy in India are very deep. Probably it is India where democracy started functioning first. It is evident from the existence of institutions like Sabha, Samiti and Viditha in the Vedic era. However, the democracy in India seems to be going in the reverse gear. It is assuming a mob mentality. If the representatives in a democracy are not responsible, they weaken it instead of becoming its defenders. The need is to reduce possibility of abuse in democracy to the minimum from time-to-time. It is necessary to make democratic system of governance firm, healthy, disciplined and responsible and the democracy should be saved from becoming a mobocracy. Despite the large number of people coming together mobocracy can never be the reflection of a democracy. Due to lack of discipline and control over the crowd a mobocracycannot transmit the will of the people. Therefore a mobocracy is more dangerous than a dictatorship. The Mob has no mind, no premeditation. They act in frenzy. How can a democracy be devoid of mobocracy? How can it be transformed into a real people's rule? Mahatma Gandhi was of the opinion that it was possible through the process of constant reforms in democracy and not in avoidance of it and that too in accordance with demand of time and prevailing circumstances. So, for the rise of the institution of democracy, the people have to carry on their duties and to maintain discipline.